Heart that architect, Mr. Kengo Kuma put "Warm, easy shopping street"
Only a month after the desperate earthquake disaster, Minamisanriku Town turned to the front as a Reconstruction city and began to do business. The "Sun Sun Shopping Village", which ended in 2016, was rebuilt in March 2017 as "Minamisanriku Sun Sun Shopping Village" in the center of the old town, which was raised 8.3 meters after the earthquake. 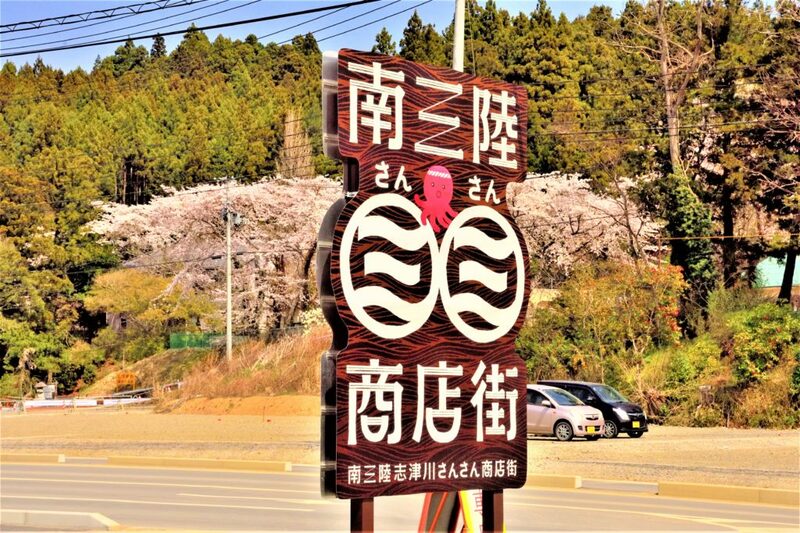 This Shopping Village is said to be a reconstruction symbol of the Shizugawa area. It is a symbol of the insatiable soul of Minamisanriku townspeople. From Sendai, it takes about 1 hour and 30 minutes on the expressway (Sanriku Road) and alight at 5 minutes after getting off at "Shizukawa IC". One year after the opening, the number of visitors exceeded 650,000. There is a food court in the center of the shopping street named "Sunsun Court". Under bright sunshine, it was a relaxing space in the atmosphere like the rim. At the Shopping village, a true Moai statue presented in 2013 from Easter Island (Chile territory) is displayed. Seasonal seafood is full of delicious "What is the Kirakira bowl?" At the "Minamisunsun shopping village", there are 28 stores, including restaurants and shops that handle daily necessities such as food, clothing and appliances, as well as photo studios. In the “Seafood products” zone, locally produced seafood and fish products were arranged in a row, and local vegetables and meat were also provided. If you look at such seafood, you will also want to eat "Kirakira bowl" where you can enjoy the seafood depending on the season. "Spring bowl" contains spring vegetables and seafood caught in the spring. "Urchin bowl" which used fresh sea urchin luxuriously in summer. In autumn, "Autumn bowl" is a seasoned fish with good fat. In winter, "Sakai-don" is filled with the delicious salmon roe. "Kirakira bowl" that ingredients change according to the four seasons. I was troubled by offering attractive and unique "Spring Tsugei" at multiple stores, but I chose "Benkei Sushi shop" which is also published in Michelin Guide. A variety of raw fish, minced tuna, salmone roe, egg and cucumber are served in colorful colors on rice. When it is thoroughly mixed and eaten, the flavor and aroma spread out full of mouth along with various textures, and it feels like spring visit has come at a stretch. The mind dances just thinking about what shop to enter next time. In the corner of the shopping district, various activities of Minamisanriku Town are introduced. On the free paper "Minami Sanriku" issued by Minami Sanriku Town Tourism Association, attractions such as food, sightseeing, life etc. of Minami Sanriku Town are published in full space. In addition, in "Minamisanriku emigrated life" issued by the Immigration Center in Minamisanriku Town, the catchphrase of the town that supports "want to do", each system of emigration support, experiences, steps to emigration etc. It is summarized clearly. I was impressed by the professional reproduction of Minamisanriku Town even if I saw the booklet and the website of the Internet, I was convinced that it was an activity to be a sample of many local cities across the country. My last stop was the memory of Minamisanriku, "Photo Studio Saryo Studio". The photographer Mr. Shinichi Sato, who is also a victim, is displaying a city that has been shooting after the earthquake. The nature and life of Minamisanriku Town, which was full of various colors before the earthquake, is beautifully depicted, and its spectacular process of color and smile being deprived of it by the earthquake is recorded. People who visited this shopping street and saw this photo exhibition will remember their lives and hometowns, and will have various thoughts in mind. Seven years after the earthquake. A color that is gradually recovered. Mr. Sato continues to shoot the children who play a leading role in coloring and the process of reconstruction. Mr. Sato's soulful photo collection (300 yen per sale will be donated to Minami Sanriku) will return to the correct origin of the reader and will keep pushing back even if it is in a difficult situation. I strongly felt that I would like to see how the color of people in the town return to the future through the photos that Sato will continue to take in the future. There was a local man who was looking at the site during reconstruction work from the Shopping village for a while. It is possible to keep various thoughts in your heart and live every day. When I tried to get a car out of the parking lot, I looked up at the guide version of Sunsun shopping village, and the cherry blossoms were in full bloom behind. Even now Minamisanriku town, with cherry blossom wings, looked like it would flap in a bright future. I left Minamisanriku Town, which received various things, while watching Shizugawa High School surrounded by cherry blossoms in full bloom on a hill. Access from SendaiGet on the JR Tohoku Line train at “Sendai Station”. Transfer to JR Kesennuma Line train at “Kogota Station” and/or “Maeyachi Station”. I left Minamisanriku Town, which received various things, while watching Shizugawa High School surrounded by cherry blossoms in full bloom on a hill.Get off at JR Kesennuma Line “Yanaizu Station” (approximately 2 hours from Sendai, Take the BRT (Bus Rapid Transit) bus by JR (Japan Railway) that will take you into downtown Minamisanriku (the bus drives on what was formerly a Japan Railway train track, but washed away in the tsunami from the 2011 Great East Japan Earthquake). If you are riding from Sendai Station, go to Bus Terminal #40 marked on the map (west exit).Total 4 buses by Miyagi Kotsu (Miyakoh) leave Sendai Station everyday from Bus Terminal #40 (8:20, 11:25, 14:20, 15:20, 16:50, 18:25 as of March 2019). This bus will take you directly to Minamisanriku (approximately 1.5 – 2 hours from Sendai). Get off at either Shizugawa Station or Utatsu Masuzawa Station depending on your travel plan. Visit the Asuka Village, a place related to Manyo, which is a hot topic in the new era "Reiwa"
Spring solemn scenery of Tsubosaka temple! Fascinated by "Sakura Daibutsu (Buddha statue among the cherry blossoms)"
The beautiful cherry blossoms of Tohoku even if it is scattered "The sakura carpet formed by fallen blossoms in Hirosaki Park"
A hill that leads to the sky! Blue carpet created by "Nemophila"
Invitation to Japan All Rights Reserved.